Whenever I offer freshly extracted carrot juice to people, they often turn up their noses. But if they’re brave enough to give it a try, they’re almost always amazed by how sweet and delicious it tastes (not what they expected at all). The most pleasant surprise for them is how well they feel after drinking it. Next to Reiki, freshly extracted vegetable and fruit juices are perhaps the best source of life force there is. Wonderful for an energy boost, they also boast tremendous healing power! My teacher, Mary Goslen, emphasized that this healing technique would be of limited benefit if I weren’t conscientious about the energy of the food I was ingesting. Though juicing isn’t part of Reiki, she strongly suggested it because of its marvelous health benefits. She directed me to resources where I learned about the huge nutritional difference between raw and cooked vegetables. Cooking food destroys the vast majority of its nutritional value, including the many enzymes the body needs for digestion and overall health, as does the pasteurization process that most store-bought juices undergo. Fortunately, fresh raw vegetables and fruits retain much of their life force even after harvesting, rejuvenating our bodies when ingested. Cooked food is essentially dead and often drags us down energy- and health-wise. The advantage of juicing raw vegetables and fruits is that the process separates their vital nutrients and living essence from the fiber, or pulp. Fiber has no nutritional value and takes several hours to digest, during which considerable amounts of nutrients are lost before they can reach our cells. However, our bodies can assimilate these nutrients in liquid form in about 10 to 15 minutes. Of course, juicing doesn’t replace eating raw vegetables and fruits because their fiber is crucial for proper digestion. But many people’s plumbing is so clogged that their digestive systems don’t work well enough to absorb enough nutrients this way. Most Americans don’t eat the recommended daily allowance of five servings of vegetables and fruits, and juicing is a powerful means of correcting this dietary deficiency. Drinking fresh vegetable and fruit juices is almost like intravenous feeding, enabling their nutrients to directly enter the bloodstream and immediately begin feeding the cells and restoring the immune system to health. 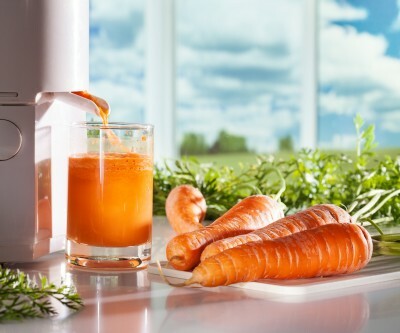 You couldn’t eat enough carrots in a day to equal the nutritional benefits of one glass of carrot juice. When you eat a raw carrot, you can assimilate about 1 percent of the available beta-carotene, but that number jumps to 100 percent if the carrot is juiced. Whenever I drink down a glass of fresh juice (I prefer a tasty combo of carrots, golden apples and spinach), I feel a tremendous surge of energy as my body assimilates that life force. Years of working with Reiki have greatly heightened my awareness of my body’s “chi,” so I definitely recognize a huge rush when I’m getting one. But please note that this is the kind of energy that heals your body and brings you into balance, not the caffeine-fueled variety that keeps you wired. I became hooked on juicing after only a handful of visits to health food store’s juice bar and decided it would be much more cost effective if I did it myself. I bought a great juicer for less than $180 (you can probably find them cheaper now) and was surprised by the ease of its use. I can complete the whole process of cutting and washing the vegetables and fruits (no peeling required), juicing, and cleaning up in less than 20 minutes. I try to make a quart every two days, typically using carrots as the base because they contain so many nutrients and produce a surprising amount of juice, which mixes well with a wide variety of vegetables and fruits. The thing to remember is that light, air and time kill off the enzymes and other living nutrients in fresh juice. I store my juices in refrigerated glass bottles and consume them within 24 hours of juicing. Check the dates on store-bought unpasteurized juices because they’ll lose considerable oomph after a day or so, especially if they’re exposed to light.